The Atlas maps show dramatically that Cuckoos are now found in far fewer places than twenty years ago. Their population in the UK has been in free-fall during that time, with the national index dropping by 56% from 1984 to 2004. It is officially on the Amber List of species of conservation concern, and at the next revision will surely be moved to the Red List. 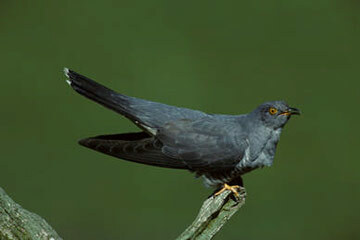 The only British brood-parasite, female Cuckoos lay a single egg in up to 25 other birds’ nests each year. Their eggs have a short (about 12-day) incubation period so that the Cuckoo chick hatches quickly and then pushes the host’s eggs or small chicks out of the nest, so that the host foster-parents devote all their efforts to feeding the Cuckoo chick. Their main hosts are Dunnock and Meadow Pipit. In more south-easterly parts of Britain, the Reed Warbler is a common host for Cuckoos, but this had only been recorded twice in Cheshire before 1988, when 9 nests at Rostherne and 3 at Woolston were cuckolded that year (Calvert 1988, Smith & Norman 1988). Cuckoos were then recorded from at least four Cheshire Reed Warbler sites over the next few years, including annually at Rostherne 1988-1993 (Calvert 2005) and at Woolston until 1995 and again in 1998. There is no definitive explanation for the drop in Cuckoo numbers, but three postulated reasons. First, the two main host species for the Cuckoo have both declined, by around 40% in the last thirty years, so opportunities for cuckoldry have dipped as well. Secondly, many moths are scarcer, including those species, the hairy or brightly coloured poisonous ones, on whose caterpillars adult Cuckoos largely feed (Conrad et al 2004). For instance, the garden tiger moth, whose large black hairy caterpillar is poisonous to all British birds apart from the Cuckoo, has decreased, also by over 40 per cent in the past 30 years. The decline of moths is thought to be caused by higher levels of pesticides in the environment, and the spread of fungi, encouraged by milder and wetter winters, which attack the overwintering caterpillars. Thirdly, conditions on the Cuckoos’ African wintering grounds are probably more difficult for them, especially with periodic droughts cutting the invertebrate populations. It is not well-known where they winter, but birds migrate to the south-east out of Britain and certainly cross the Sahara. There is no obvious explanation for the current distribution of county records. They are clearly absent from built-up areas, and seem to be especially scarce from Chester along the length of the Wirral. They are not much restricted by habitat, of which Cuckoos have a catholic choice, and more than 30 different codes were recorded, spanning woodland (20%), scrub (9%), grassland (6%), farmland (54%), human sites (7%), reedbeds (2%) and others (2%). As well as a major decline in the number of tetrads in which Cuckoos were found – from 535 in the First Atlas to 229 now, the biggest drop of any species – there are massive falls in the proportion showing confirmed breeding (from 51 to 4 tetrads) or probable breeding (from 271 to 13 tetrads). The four confirmed breeding records comprised three ‘RF’, with chicks, only weakly flying, two being fed by Dunnocks and the third by a group of House Sparrows, and one Reed Bunting nest with a Cuckoo chick. Although a seven-year survey, as our First Atlas was, will inevitably achieve a higher proportion of the higher breeding status codes, there are probably some observer effects including the continuing aversion from nest-recording and a reduced familiarity with the female calls, which in itself indicates how scarce the species has become. The males’ onomatopoeic ‘song’ is well-known, but the females’ bubbling call, often given after laying an egg, or responding to a male, is much more likely to indicate that the species is breeding in the area. However, many of the Atlas records are of birds present for a day or two only, perhaps on passage; many observers noted that a Cuckoo was heard on just one visit, and daily recording at some sites indeed showed that the majority of the calling males did not apparently stay. Based on these figures, the Cheshire and Wirral population is unlikely to exceed 50 breeding birds, and may well be less.